A fantastic weekend was had by all as the Newark Twinning Association celebrated 30 years of twinning with our German friends in Emmendingen. 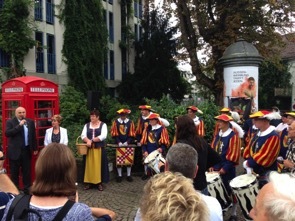 The three-day trip saw several events taking place including the unveiling of the new red telephone box. The original was given to Emmendingen as a gift at the start of our friendship but was damaged last year in a storm. Upon arrival in Germany, and our twin town, we were warmly welcomed with local beer and wine at the Steinhalle before heading to our respective host families. Friday saw us visit the beautiful town of Breisach am Rhein and the stunning St. Stephanmünster from where there are stunning views over the River Rhine. The afternoon saw us visit the beautiful vineyards of the Kaiserstühl area of the Black Forest, where we took a tractor (yes, a tractor!) up to the hilltop setting for our lunch among the vines. Many of us tried several glasses of the local wines – all of which are highly recommended! The area is well known for its views of Germany, France and Switzerland as well as top quality wine. Many visitors decided to walk up the hill among the vines and were offered a history of the vines. The evening saw the two towns join together for a convivial evening in the Altdorfhalle with a local comedian and bands performing for host families and Newark guests alike. The evening went down a storm with plenty of laughs and delicious food. The official part of the weekend saw the unveiling of the new red telephone box, donated by X2 Connect of Newark, who renovated the old box which originally stood on Castle Gate in Newark. The box was first used by Mayor of Newark, Tom Bickley, Twinning Chairman, Rita Crowe, and Oberbürgermeister of Emmendingen, Stefan Schlatterer, who entered the phone box to a great fanfair from the Hachberger Herolde, who then lead the official party to the town's Markt Platz. A stage was then set for Newark Amateur Operatic Society singers Matt Shephardson and Jo Dewberry who performed solo and duets from the shows ahead of the Society's grand performance later that evening evening. The afternoon saw the group enjoy the local area and free time before the official evening ceremony, which was opened by a local band formed of school children who performed an amazing set of songs as part of the Crazy Marquis band. Before the re-signing of the twinning charters between the towns, which was witnessesd by the Deputy Mayor of Sandomierz and the Mayor of Six-Four-Le-Plages in France, the Mayor of Newark Tom Bickley mentioned how strong the links were and the importance of the friendship between the two towns. He also presented a violin, created at the Newark International Violin School, as a gift to Emmendingen from Newark. The evening and weekend was well rounded off by the performances of songs from the shows by the Newark Amateur Operatic Society, who sang songs from “Me and My Girl”, “The King and I” and “Les Miserables".